Two features prevent that from happening. The hand brakes are configured as “pull-to-go”, in contrast to typical hand brakes. Also, a friction mechanism regulates the two large wheels on the base, according to the needs of the particular patient. Is the U-Step 2 suitable for someone 4 feet 9 inches tall? Is the U-Step 2 suitable for someone 6 feet 5 inches tall? I mentioned the U-Step to my physician, but s/he is not familiar with the model. Call In-Step Mobility at 1-800-558-7837. We can provide your physician with information about the U-Step, and we can check whether other physicians at the same location are already familiar with the walker. I‘d like to try walking with the U-Step, but my physician doesn’t have one in his/her office. Where can I try one out? If you currently receive therapy or medical care from a practitioner associated with a major facility, the facility’s Neurology or Physical Therapy department may have one available for demonstration. Certain medical stores can show you a demonstration unit on their premises. Your local Parkinson’s support group may also know who has a U-Step in your immediate area. 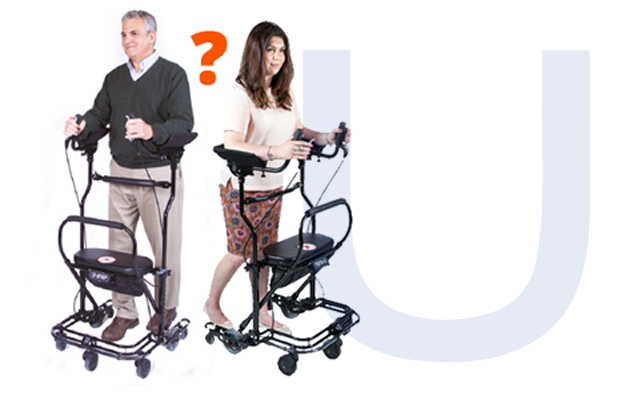 Call In-Step Mobility at 1-800-558-7837 for more information on how you can try out our products. Will Medicare or insurance cover any of the cost? 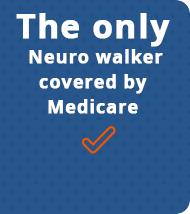 Medicare reviews each patient’s medical condition to determine whether the U-Step and U-Step 2, classified as advanced walkers, will provide mobility that a standard walker cannot provide. The criteria include “severe neurological disorder or other condition restricting the use of one hand”. Other insurance plans may use the same criteria, or they may offer greater coverage, depending upon the particular plan. Read Our Insurance Page for more information. Do Medicare Replacement Plans insure the U-Step or U-Step 2? Most plans provide coverage according to terms similar to Medicare’s, though they may specify where to obtain the U-Step in order to qualify for coverage. Call In-Step Mobility at 1-800-558-7837 for assistance with your particular situation. The two rear wheels are not level with the other wheels. Is that normal? That is by design. When walking on ramps or uneven surfaces, the rear wheels stabilize you without hindering your progress. Their spring-loaded mounting can be locked, according to the user’s need. How do I change the original U-Step LaserLight batteries? The battery compartment inside the basket unscrews to open. Use two AA alkaline batteries oriented in the proper direction. How do I change the original U-Step caster wheel? Over time, accumulated carpet fibers or pet hair may inhibit one or more caster wheels. In-Step provides replacement wheels for a modest charge. To remove a wheel, use a hammer as you would to remove a nail. To insert a wheel, apply force with a tool such as a rubber mallet.